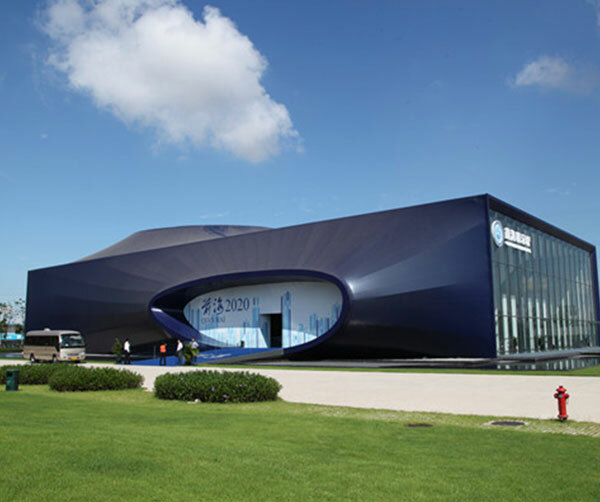 Qianhai Exhibition Hall is a temporary building with a five to ten-year term of use. The main exhibition building forms a horizontal rectangle and provides a dynamic and futuristic model with its smooth, natural free-flowing curves running along the length and exterior of the structure. The surface of the Hall is covered with an elastic material and decorated with transparent material of different sizes – these daring and innovative choices express the belief that time strengthens expression. The design is divided into three capsules – outer, middle and inner – in which the middle and the inner capsules are free-formed undulating bodies, uniting to create a surreal sense of space. Qianhai Exhibition Hall (“Hall”) is located in Shenzhen, at the intersection of Dongbin Road and Yueliangwan Boulevard, Liyumen lot, south of Dongbin Road, Qianhai, Nanshan. The temporary exhibition building is to be used over a five-year term and consists of two floors purposed for exhibition, meeting and communication, reception and other related functions with supporting facilities. The Hall covers an area of 20,979.60 square metres with a total construction area measuring 4323.7 square metres, which is 3,900 square metres when taking the plot ratio into account; the overall height is 17.8 metres, and the two floors are respectively 6.5 metres and 4.5 metres high.